This summer I went to Lords for the England-Pakistan One Day International. Sitting high up in the Warner Stand as the England team came in to bowl, playing the match through gritted teeth, I was struck by how poisonous the atmosphere was. Three Pakistani players had been accused - are still accused - of fixing spot events in a Test Match - framed by a tabloid newspaper. In a fit of pique, the Pakistani tour manager had hurled accusations back at the England team. The result was a match played because it would have been a bureaucratic nightmare to do anything else. It was pitiful to be sitting at Lords and to feel alienated from the game I love - the game that had dominated my childhood and still forms the major part of my telephone conversations with my father. How wonderful then to see FIRE IN BABYLON - Stevan Riley's new documentary on the golden age of West Indian cricket, under Clive Lloyd and the Vivi Richards. It was just pure delight to be sitting in the Vue 5 surrounded by people who also love cricket, nostalgic at the memories of great test matches - watching sheer skill and determination triumph over previous failure and injustice. I laughed, I cheered, I applauded, and I came out feeling good about cricket again - about what it can achieve in a wider context when its players choose nobility over cash. It was like a trip back to my childhood. 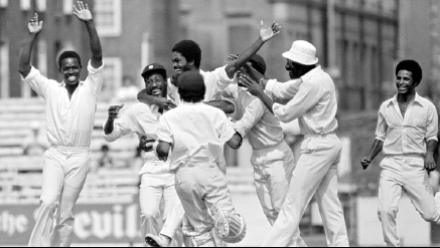 Is there anything more glorious than seeing great men - Clive Lloyd, Vivi Richards, Gordon Greenidge, Roberts, Holding, Garner - tell us in their own words how they felt through defeat and victory? The racist abuse they suffered? The politics they were living through? The brickbats they faced from the press? But best of all - seeing the pride on their faces at the victory they achieved, not just for themselves but for every West Indian. Because the achievement of that team was not just to dominate - DOMINATE - test cricket for over a decade but to give their countrymen - faced with racial prejudice - something to be proud about. And for the rest of us, what they gave us, was just sheer joy at watching class players play with skill. The documentary is basically a straightforwardly constructed retelling of the West Indies triumph, in broadly three acts. The prologue sets the context - before 1975 the West Indian team is entertaining but unsuccessful - derided as Calypso cricketers - and paid less than their white counterparts. In Act One, strategic titan and disciplinarian, captain Clive Lloyd, takes a young, focused team to Oz where they are pummelled by Thomson and Lillee's furious, aggressive pace. He decides to take off the gloves, scouring the West Indies for young fast bowlers - Roberts, Croft, Holding and later Garner. In Act Two, the West Indies shocks the world with its deadly pace, pummelling a cocky England, whose captain Tony Greig - in his South African accent - had said he'd make the WIndies grovel - and then pummelling Oz. In Act Three, we are now in the mid-80s, success continues, and the captaincy hands over to Vivi Richards, and we see names like Malcolm Marshall come to the fore. This story is punctuated with two key political episodes. The first is the Kerry Packer World Series when several players took large amounts of money to play in a renegade series in Australia. At first the West Indian cricket board bans the players, but soon, under public pressure, brings them back. The key point is that in the interim they have become hugely fit and focused thanks to an Aussie trainer. The second episode is far more important. In the early 80s several players took money from the Apartheid regime in South Africa to play there. In doing so they were ostracised at home and had effectively sold their soul - becoming "honorary whites" on the tour. Colin Croft went. Vivi didn't - and in doing so turned down a blank cheque, stopped a run on the team, and basically cemented his status as all round great man. The key strength of this doc is how many people the film-makers persuaded to appear, and how candid they are. Vivi features large, as you would expect, but Andy Roberts is also really impressive. One of the most poignant clips is of Colin Croft speaking about his South African tour. He starts off very defensively - saying he was just taking money as in the Kerry Packer tour - ignoring deliberately the very different political aspect. But then toward the end, he looks sad and guilty and the camera quickly cuts away. It's discrete and powerful. I also love that the documentary gives voice to the fans - the groundsmen - Bunny Wailer even! - who relive their joy and pride at the team's success. I guess my only quibble would be what must presumably have been the editorial choice not to interview English or South African players or Umpires to give the other side of the story. Maybe it was part of the politics of this project, to let West Indians own and tell their story, coming back at the tabloid hate, setting the story straight. But the problem with that approach is that you end up with a documentary full of West Indians talking about how great they are. And let's be clear, they ARE great! But no-one wants to watch 85 minutes of uninterrupted hagiography. Still, I have to say that FIRE IN BABYLON is about as much fun as I've had in the festival this year. It gave me back my passion for cricket and I came home and started watching clips of Vivi and Gordon Greenidge on Youtube. But it's appeal is wider than that. I am reliably informed by my bag-carrier, a Kraut who suffers from never having watched a cricket match, that the story is fascinating beyond the sporting achievement - because it's bigger than that - it's about a people finding self-confidence after years of colonial rule, and forcing the rest of the world to give them the respect they deserve. Additional tags: Balazs Bolygo; Stuart Bentley; Stevan Riley. FIRE IN BABYLON does not yet have a commercial release date.